Celebrating our Colleagues' outstanding achievements. Here at Westgrove, we like to reward both our individual colleagues and teams alike and as such, we hold an Annual Reward and Recognition Ceremony to celebrate their achievements. 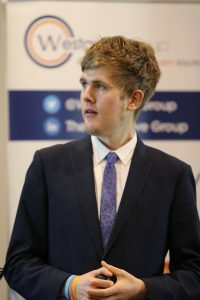 The event this year took place at the Village Hotel in Warrington with guest speakers Paul Keeling CEO at the Senate Group and our Brand Ambassador, Alex Staniforth (both pictured below). Colleague of the Year – Tom Lewis, Business Manager, Haymarket Shopping Centre in Leicester. Tom shows great initiative and he has been pivotal in helping other Business and Site Managers to work smarter. 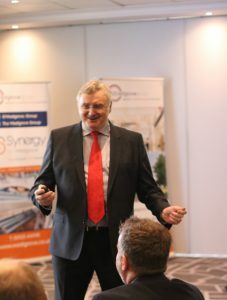 Service to our Partner – Barry Burnham, Templars Square in Oxford. Barry has worked tirelessly to understand the intricate workings of the machinery in all three car parks, saving our Partner money. Service Excellence of the Year – David Lightfoot, Grosvenor Shopping Centre in Chester. Dave came to the rescue after a lady lost her balance and fell down an escalator. CSR Initiative of the Year – Margaret ‘Mags’ Gill, Peel MediaCityUK, Manchester. Mag’s impact on Pure Innovation supported intern Stefania Ilenikhena was fantastic. We are delighted that Stefania is now part of the Westgrove cleaning team at MediaCity. Achiever of the Year – Phillip Burne, Haymarket in Leicester embraced the Westgrove Aspire Customer Service Training, developing his own personal skills. Outstanding Act of the Year – Richard Farley and Paulo Ribeiro from the Kennet Centre in Newbury, Berkshire. Richard and Paulo’s swift thinking saved a stabbed man’s life after they spotted a suspicious man putting a cover for a knife in a bin. Team of the Year – Ropewalk, Nuneaton, Warwickshire. Quick thinking and fast action from the Ropewalk Security team helped to prevent a situation from escalating.